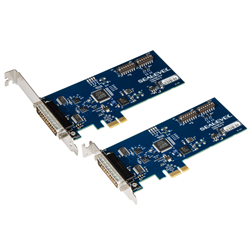 Sealevel's best-selling dual-port multi-interface PCI Express serial adapter has been enhanced with the release of the 7205ec. Sealevel's best-selling dual-port multi-interface PCI Express serial adapter has been enhanced with the release of the 7205ec. This new board features an ultra high-speed UART, flexible clock prescalar, and larger 256-byte Tx/Rx FIFOs that allow the adapter to support the widest range of standard and non-standard baud rates exceeding 1 Mbps. These improvements make the 7205ec ideal for data intensive applications that require reliable, ultra-fast throughput rates. The electrical interface, echo suppression and line termination continue to be set via convenient on-board DIP switches. Optionally, these settings can now be overridden by the Windows device driver. Another addition to the Windows driver is the software-selectable Slew Rate Limiting feature that minimizes electromagnetic interference when the serial ports operate at baud rates below 250K bps. For rapid troubleshooting, on-board LEDs have been added to display the board heartbeat, confirm electrical interface selection and line termination state. The 7205ec is a “form, fit and function replacement” for the 7205e; existing customers of the 7205e simply need to update to the latest 7205ec software driver to ensure their application will continue to operate as expected. The 7205ec is a PCI Express X1 board compatible with any low profile PCI Express slot. Low volume price is $259 and the board is available from stock.